동국대학교 소장 는 1546년(명종 1)의 증광시(增廣試) 문·무과 합격 동기생 5명이 1567년(선조 즉위) 전라도 광주의 희경루에서 만나 방회(榜會)를 갖고 제작한 기년작(紀年作) 계회도(契會圖)이다. 신묘생진시(辛卯生進試, 1531년)의 동방들이 1542년에 만나 제작한 와 함께 현전하는 16세기의 방회도 2건 중 하나이다. 방회도는 16, 17세기에 집중되어 있는데, 그 중에서 는 1550년의 및 와 함께 이른 시기에 제작된 사례이다. 대부분의 16세기 계회도는 수묵화로 그려졌으며 채색화로 그려진 경우는 드문 편이다. 이 는 모임의 주체와 장소 등을 고려해 볼 때 전라도 광주 지역의 화사(畵師)가 그렸을 가능성이 높아 지방화단에서 그려진 채색계회도라는 점에서도 의의가 있다. 제목, 그림, 좌목, 최응룡으로 추정되는 ‘완산후인(完山後人)’이 쓴 발문까지 계회도의 형식을 온전하게 갖추고 있다. 인물을 묘사한 필치는 매우 생기 있고 활달하며 자신감이 넘친다. 또한 비슷한 자세의 인물을 같은 모양으로 판에 박은 듯 반복해서 그리는 투식적인 면이 적다. 희경루 건물 묘사에서도 보이는 대로 그린 듯한 꾸밈없는 필치를 엿볼 수 있다. 이상과 같은 이유로 는 제작시기, 양식적인 특징, 회화적 가치 면에서 가치가 크다. This painting of a group of association members gathered at Huigyeongnu Pavilion is believed to have been painted by a local artist based in present-day Gwangju, Jeolla-do. 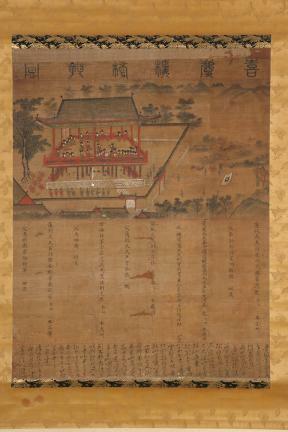 The painting is regarded as a valuable material not just because it is a color painting depicting a social gathering of the local elite produced by a local artist, but because it has a postscript written by Wansanhuin (or Choe Eung-ryong) containing information about the title and the names of the participants in the gathering and the artist who painted it. The painting is characterized by the use of energetic, confident brush strokes and restrained plain touches that capture the pavilion as it was seen by the artist.